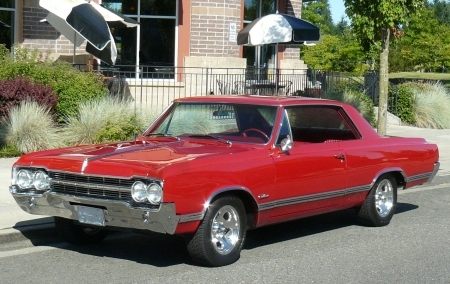 1965 Oldsmobile Cutlass Holiday Coupe "Ruby 2"
This is definitely a story about reliving my past. In early 1968 I was single, working a pretty good job and looking for my next ride. The target red 65 Olds Cutlass Holiday Coupe spoke to me. It spoke to the girl I was dating at the time too. She said it looked like "Ruby" lipstick. Well, I married that girl in 1970 and as we've gone through our lives together, (over 45 years now) we've owned a lot cars, some fun and sporty, some pretty boring, a couple of station wagons, and a minivan, but Ruby was one for the books. 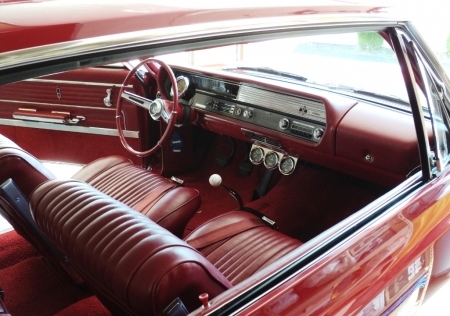 "Ruby 1" - 1965 Olds Cutlass Holiday Coupe, Parchment White top over a Target Red body, factory 4-speed and a very stock, 315hp, 330 cu in Rocket V8, factory red "Moroccan" bucket seats with console and tach. I put on dual exhaust with "glass-packs" and hung an 8-track player under the dash. We "cruised" 6th Avenue in Tacoma, Washington. It was a scene right out of the movie American Graffiti. The picture below is Ruby 1 in July of 1968. Flash ahead, as they say, to 2005. I started looking to relive the fun we had cruising in that target red hard-top, and the search began. In September of 2006, I came across an internet ad from Southern California. It was a "nice '65 Cutlass Holiday Coupe, survivor", and it was Target Red! I called the owner and explained what I was looking for and that I had owned an Olds just like his over 38 years ago, same color and everything. I flew to California, crawled around, under and over it, drove it, and made an offer. He turned me down flat, insulted by my trimming nine hundred off the asking price. I went home to Washington state. Thankfully, he called a couple of days later and we made a deal. This Cutlass was built in Fremont, California, the third week of August, 1965, a Target Red (top and body), Holiday Coupe, red bucket seats, 2-speed Jetaway on the column, 315 hp, 330 cu in Rocket V8, with factory A/C. I tracked down later that it was purchased new by a school nurse from Pasadena, and issued a California "Black Plate" with RSL013. 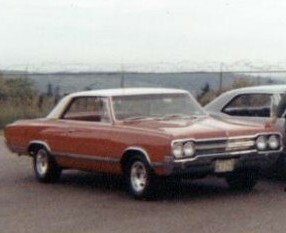 It had been purchased from Kaiser Bros. Oldsmobile in Los Angeles. My brother and I drove down with a car trailer and brought it home. My wife immediately dubbed this Cutlass "Ruby 2". I'm fortunate to know the history of this car because a copy of the 1976 California owner registration was in the glove box. Remarkably, after a simple letter to the last known address, I received a response and a lot of historical information from a great guy in Pasadena. He had been related to the original owner and had been friends with the second owner for nearly 30 years. The Cutlass had sat unused for over 27 years and when that owner passed away in 2004, the car was auctioned off to the third owner. I bought it from the third owner and started on a significant restoration. It has been my mission to keep the car as original as possible, but I wanted a safe and "drivable" classic, and I'm not a purist. So, I started with the mechanical, installing a new Edelbrock Performer, all new hoses, period style dual exhaust, rebuilt the front and rear suspension, American Racing wheels and some modern Radial tires. Next came the interior. I started by recovering the dash pad, repainting the metal dash insert, purchasing and installing a "correct" AM radio, replacing door and rear panels, new chrome arm rest bases and covers, new package tray, new front and rear speakers and rear seat divider. New carpet and padding, plus re-carpet kick panels, inner rear window trim kit, then R&R'd the heater/AC controls and corrected wiring and vacuum hoses and replaced the blower motor. Glove box liner, all window felts, new seat belts, and new GM reproduction sill plates. Original Parts Group, Year-One, The Parts Place, Fusick, and Evergreen Muscle Car, (Auburn, WA) have a lot of my money. Upholstery help came from a high school buddy, who just happens to own a great little upholstery and glass shop in the town where we both grew up. In 2009, I decided to take on a complete re-paint. Since the third owner had stuck a $99 special on "most of the body", my first task was to strip the entire outer car body down to near bare metal. This required removing the fenders, hood, doors and trunk. I also wanted to re-do the body and door jams, trunk compartment, and all the rubber, which required complete disassembly of the doors. The body was a great example of how forty years in a dry climate can have a positively impact on old car bodies. With literally zero rust and only a miniscule amount of body work, the car was ready for paint. Finishing included 3 coats of PPG Prima (K36) primer, two coats of PPG Epoxy (DP74LF) primer/sealer (Red Oxide) followed by PPG Deltron/DRC 2000 Base Coat (custom mixed to GM specs for 65-66 Olds Target Red) and 3 coats of PPG Concept Clear. Of course, the final finish work included hand color sanding, machine cutting and final machine buffing. While in the "borrowed" paint shop, I sent a few things out for re-chrome. It took nearly 5 months, but that's because for the most part, I was working on my days off and weekends. Then, in 2011 I had had enough of shushing around with an old Oldsmobile 2-speed automatic and took on the much desired 4-speed conversion. The year before, I had even moved the auto selector to the floor, including restoring and installing an original console and tach. Still, I needed to be "shifting". Finding the parts was not that difficult. Flywheel, bellhousing, pedals, etc. and good used Muncie M20 were pretty easy to collect. I bought a clutch, pressure plate kit, Hurst Comp Plus linkage and rebuilt that used gear box. Then the fun started, installing it all, but I wasn't blazing a new trail. I asked a lot of questions (local and on the internet), fell back on my own hot rodding days of "trial and error", and got it done. Going through the gears has never felt better than it does today. Finally in 2013 I decided it was time to "do the motor". Now, at 48 years old, though only 71,800 miles, the original 330 ci. small block was getting tired and smoked a little. With help from that same great brother, we pulled it apart and sent the short block plus heads off for complete yet "mild" rebuild/upgrade. Upgrades included pretty stock but balanced pistons/rods, etc., cam, rebuilt heads, electronic ignition, but kept stock intake and exhaust manifolds. Well, "Ruby 2", is and will always be, a work in progress, though I'm through the major stuff. In the mean time, we sure are enjoying "reliving my past", and "cruising" on as many nice sunny weekends as we can find here in the Northwest.